Lella Lombardi holds a unique place in Formula One history as the only woman to score points in a championship race - well, half a point after finishing sixth in the accident-curtailed 1975 Spanish Grand Prix. Born into a family who did not even own a car, legend has it she only started showing an interest in racing after being driven to hospital at speed after an accident playing sport. That was fuelled when she got a job working as a gofer for a racing driver, and she graduated to his co-driver and then after persuading him to let her have a solo drive, won her first race. 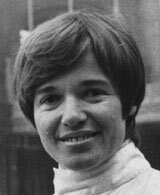 For a while she drove touring cars before switching to single seaters, and in 1974 she competed in the British Formula 5000 Championship as well as trying - and failing - to qualify for the British Grand Prix in an old Brabham. In 1975 she persuaded Count Vittorio Zanon to fund her entry into F1 and in a March she became the first woman to qualify for a grand prix when she made the grid in South Africa. This gained her sponsorship, and the headlines followed with her half point in Spain although it is only fair to say she was two laps off the lead when the race was stopped in the 26th lap. It was no one-off as later in the season she took a seventh at the German Grand Prix. After one race in 1976 she was replaced by Ronnie Petersen and after a short spell with an old Brabham for the RAM team, she dropped out of F1 but continued her career in sports cars. She died of cancer in 1992.